Jon Spaihts, Screenwriter, DOCTOR STRANGE, was our MC for the night. Throughout its history, Hollywood has struck cinematic gold again and again with a simple yet irresistible concept: the superhero film. The idea of individuals — whether human, mutant, or extraterrestrial — that use their powers for good has escapism, thrills, and hope for humanity all wrapped up into one slick-looking package. In particular, the Marvel Cinematic Universe has captured the enthusiasm of children and adults alike. With 13 feature films and 5 television series already under its belt, the media franchise uses compelling storytelling, humor, and universe-wide consistency as keys to its immense success. As a celebration of the science behind the stories, the latest Science & Entertainment Exchange event brought hundreds of Marvel fans to The Great Company in the Arts District in Downtown Los Angeles for a multi-sensory, immersive learning experience. “Science of the Marvel Cinematic Universe” featured three speakers, two panels, interactive activities, and a museum of Marvel artifacts. Marvel Studios and The Great Company co-produced the event along with The Exchange, and it was made possible by Honor, Google, and the Alfred P. Sloan Foundation. The Exchange has provided scientific consultants to Marvel Studios since the first Thor movie and “Science of the Marvel Cinematic Universe” highlighted their latest collaborative effort, Doctor Strange. This film tells the story of a prominent neurosurgeon whose world is turned upside down when he loses the use of his hands. Dr. Stephen Strange goes from a life guided by traditional medicine to the realm of unexplainable magic. Marvel Studios prides itself on scientific continuity throughout its many movies, so Frank had to figure out a way to incorporate Doctor Strange’s Eastern-influenced magic with the rest of the franchise. Instead of using a neuroscience-based event to explain his powers, which would not have honored the original comic book character, Frank instead turned to philosophy. Inspired by Australian philosopher David Chalmers, he realized that because science cannot fully explain the nature of consciousness, the movie could exploit that aspect of mystery to fit Doctor Strange into the Marvel Cinematic Universe. Doctor Strange acquires his powers at an isolated community in the Himalayas, where he is initially shocked to learn of magic’s existence. Jill Tarter, the Bernard M. Oliver Chair for SETI Research at the SETI Institute, aimed to shift the audience’s everyday perspective in a similar way with her talk on exoplanets and life outside of Earth. Her work at the SETI Institute includes using the Allen Telescope Array (ATA) to observe thousands of exoplanets for the possible blip of an extraterrestrial civilization. The ATA consists of 42 dish antennas that scan space for deliberately broadcast signals in the quiet terrestrial microwave window from 1 to 10 GHz. The recent discovery of Earth-sized exoplanets in the so-called Goldilocks Zone — the range of orbits around a star where liquid water might exist on the surface — has been a game changer in her field. So while the Marvel Cinematic Universe may take the existence of extraterrestrial life for granted, scientists at SETI continue to search the skies for any real-life evidence. Finally, Alicia Jackson discussed the possibilities of creating our own superpowers in the age of genome engineering. “One of the mysteries of life I have always wanted to solve is, do we have superpowers? What are those superpowers? And can we engineer our own superpowers?” said Jackson, co-founder and Chief Technology Officer at Drawbridge Health. People with real-world superpowers may not look like The Hulk or Captain America, but they can summit Mount Everest without an oxygen tank, survive on 3 to 4 hours of sleep per night, and have immunity to HIV. Genetic mutations can facilitate such superhuman traits, but we would have to be born with that kind of luck embedded in our genomes, right? Perhaps not, says Jackson. The development of CRISPR, which stands for “clustered regularly interspaced short palindromic repeats,” hints at a world where DNA in human embryos can be snipped and edited at will. The tool works like a pair of molecular scissors that target a precise part of the genome to delete, add, or replace segments. Researchers have already used CRISPR for a number of applications — for instance, removing the myostatin gene from whippets to create extra-muscular dogs. However, CRISPR certainly is not going to create “designer babies” anytime soon, and the powerful tool is raising all sorts of ethical questions among scientists. 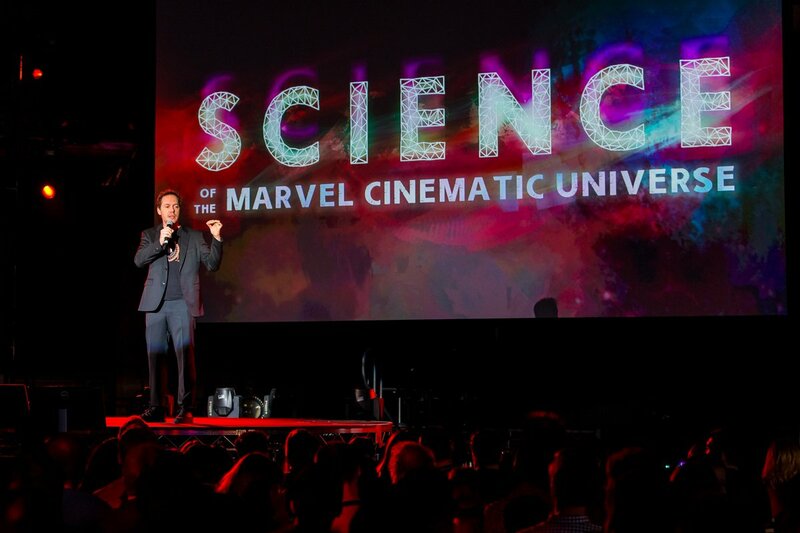 All in all, “Science of the Marvel Cinematic Universe” truly showcased some of the cutting-edge research that inspires and informs essential storytelling elements in each movie. The event demonstrated the power of bringing two worlds together — in this case, entertainment and science — to weave an epic and consistent tale.